Some days, the worst part of work is just getting there. Depending on where you live and work, commuting to the office can mean anything from sitting in stop-and-go traffic to standing on a packed train struggling to hold your bags and coffee. Almost universally, shorter is better when it comes to commuting. Workers in the Big Apple have it the worst. New York City commuters spend almost 40 minutes getting to work, according to a new report from Michael Sivak at the University of Michigan Transportation Research Institute, an organization that studies transportation safety and sustainability. In total, they spend almost an hour and a half getting to and from the office every day. Why? New York City is the most densely populated major city in America and its residents rely heavily on public transit. Going from one end of the city to the other by train, bus or foot takes time. And that’s when everything is running smoothly, which -- take it from this reporter -- is less often the case than not. That means New Yorkers spend about 15 minutes longer commuting, in either direction, than the average U.S. office worker, who spends 26 minutes getting to work, according to the report. 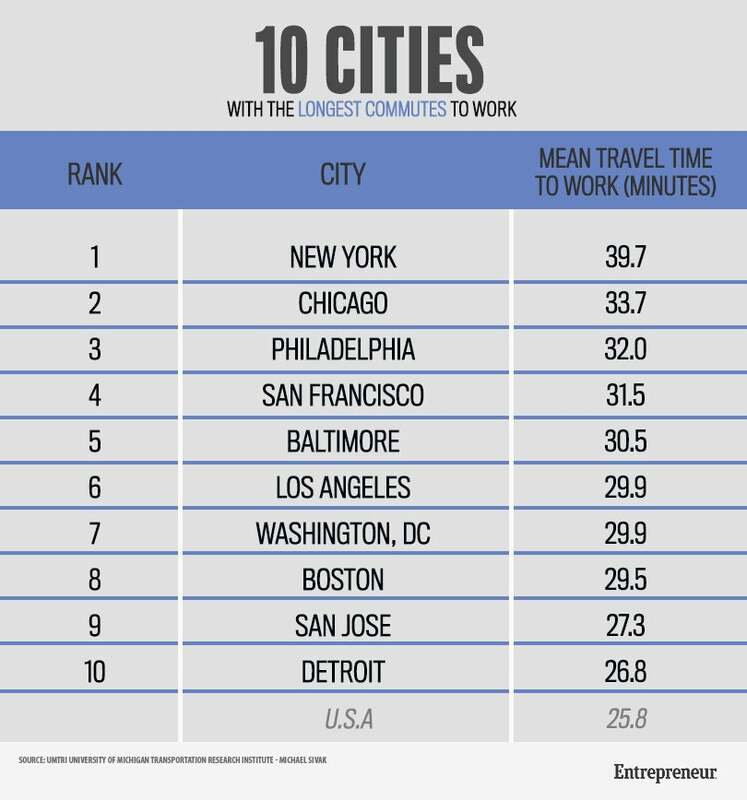 Chicago residents spend the second longest amount of time getting to and from work, followed by Philadelphia and San Francisco. The University of Michigan report measured commuting by workers 16 years of age and older in the 30 largest U.S. cities based on 2013 data from the American Community Survey, an annual survey by the U.S. Census Bureau. People who work from home were not included in the calculations. As for the cities with the shortest commutes, Oklahoma City takes the cake. Residents commute about 20.7 minutes on average, meaning they have 40 minutes more in their day than New Yorkers do. Over a five-day workweek, that’s an additional three-plus hours. Tell us: Do you have any commuter productivity tips? What do you do to make the most of the time you spend getting to and from the office? Leave a comment below and let us know.